Deadlines are a fact of life for a writer. 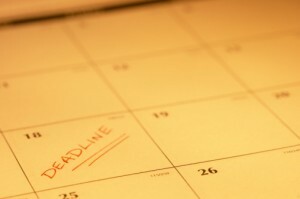 If you are deadline challenged, use these tips to keep you on track. Not only is meeting writing deadlines essential to a writing career, but it is also an essential component of a successful writing career. Every writer is different, so find a system for tracking deadlines that works for you. You may make a daily list of writing assignments that you have to tackle. You may also opt to track it in your electronic calendar or write it on your wall calendar. Try to cushion in a day or so before the article or writing assignment is due to account for any snags you may run into (i.e., unresponsive interview candidates, lack of resources or a cold that sneaks up on you). Each day as you tackle the to-do writing assignments on your list, make sure you are focusing on the ones with the closest deadlines first. This means do not procrastinate and put off your harder writing projects to the last minute. Track your progress. If you have to write a five thousand-word article, then break up your work into bite-size tasks. If you have five days until the deadline, concentrate on research and writing the first 1,000 words on Day1; another 1,000 words on Day 2, getting the article up to 3,000 words on Day 3; hitting 4,000 words on the fourth day; and writing the final 1,000 words, revising and finalizing on the final day. As you meet each milestone, mark it off your list and then move on to the next assignment or portion of the writing project. When you have a system in place where you can prioritize your work and track your progress, you’re apt to meet your deadlines.